Heat oven to 400°F. Spray 15 x 10 x 1-inch pan with cooking spray. In 5-quart Dutch oven or stockpot, cook spaghetti as directed on box. Drain and rinse. Return spaghetti to Dutch oven; set aside. In small bowl, beat milk, eggs and salt with fork or wire whisk. Stir in garlic. Stir egg mixture, 1 cup of the mozzarella cheese and the Parmesan cheese into the spaghetti until well blended. Pour spaghetti mixture evenly into pan. Cover with nonstick foil. Bake 15 minutes. Reduce oven temperature to 350° F. Remove from oven; remove foil. Evenly spread Alfredo sauce over spaghetti mixture. 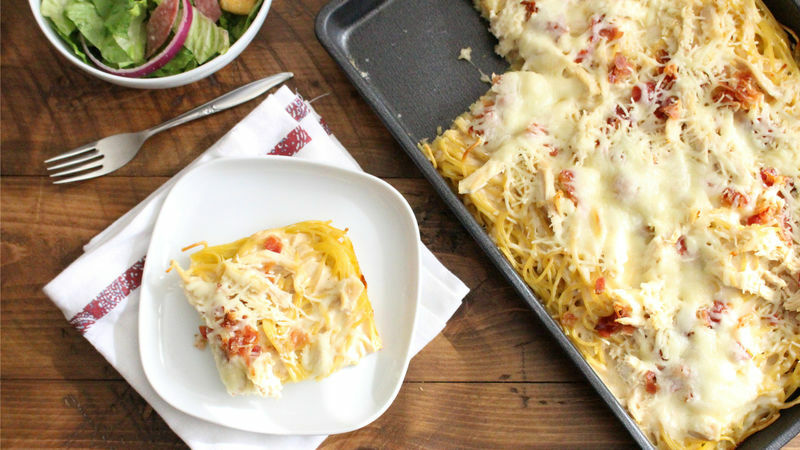 Top with chicken, bacon and remaining 1 cup of the mozzarella cheese. Bake 10 to 15 minutes longer or until cheese is melted. Sprinkle with parsley. Have fun with toppings! Try ripe olives, bell pepper, mushrooms or your favorite white pizza toppings!